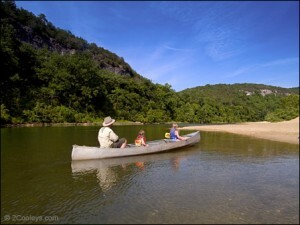 The White River in the Arkansas Ozarks is a world famous fishing destination. Here on the middle section of the river you’ll find fly and spin fishing for trout and you’ll even find smallmouth and largemouth bass in parts of our river. At Anglers White River Resort you can wade fish from the bank or rent a boat and fish with a professional guide. Best of all, you’ll get the same kind of world class trout fishing results with out the “rod-to-rod” congestion you find on the upper White River. Bass Fishing in the White River? Although famous for trout fishing, the White River also has great smallmouth and largemouth bass in our section. Anglers sits right on the confluence of Sylamore Creek flowing into the White. Sylamore Creek and several other nearby streams are warm water fisheries that provide enough warm water to support bass fishing. You’ll find our rates are some of the most competitive on the river. Full Day Guide Trip $219 – for up to 2 people $60 for 3rd person. Up to an eight hour day of guided trout fishing on the White River, your guide, a fully outfitted John boat with 25hp prop driven outboard and rod and reel. * Bait and tackle extra (usually averages less then 10$ per person) If you elect to keep your catch your guide will clean, fillet, and bag your fish. Shore lunch is available for an additional $15 per person. Half Day guide Trip $199 – for up to 2 people $50 for 3rd person. Up to an four hour day of guided trout fishing on the White River, your guide, a fully outfitted John boat with 25hp prop driven outboard, and rod and reel. If you elect to keep your catch your guide will clean, fillet, and bag your fish. Fly Fishing 2 People Call for pricing Up to an eight hour day of guided trout fishing on the White River, your guide, a fully outfitted John boat with 25hp prop driven outboard, and fuel. If you elect to keep your catch your guide will clean, fillet, and bag your fish. Shore lunch is available for an additional $15 per person. Standard Shore Lunch $15 per person Includes some of your morning’s catch filleted and fried by your guide, fried potatoes, hush puppies, beans, soda, and simple dessert. Standard shore lunches are served on the river bank or a gravel bar. Deluxe Hot Shore Lunches For Groups Custom pricing A minimum of 6 people are required for deluxe shore lunches. A deluxe shore lunch is your choice of either your custom menu or ours. Typical servings our groups enjoy are homemade sandwiches or other hors hors d’oeuvres while the morning’s catch is frying, soup, salad, potatoes, vegetables, additional BBQ meats, rib eye steaks, shrimp, and deluxe desserts. Deluxe shore lunches are served on the riverfront lawn at Anglers or in our private riverfront dining room. Please contact us for more details. It is our goal to make your group trip as relaxing and memorable as possible. Anglers has a 14-stall metal boat dock and a nearby asphalt boat ramp to launch boats. You can get gas, ice, bait and other supplies from our store and we offer a boatlift rack and motor repair. All of our boat rentals are 16-20 foot boats. They all come with newer 15hp motors, seats, life jackets and a net.